#322 "Eldar Preview, Night Goblin Armies"
We look at how to build an army of Night Goblins, including Skarsnik himself! The first in a brand new series of tactics articles. A look at some of the impressive models from the Dark Elf army as painted by the experts. Another scenario and scenery project conclude Goblin Shaman Urzbog’s campaign. Two veteran Warhammer generals discuss Battalion-level tactics and put them to the test. Phil Kelly delves deep into the secrets of this ancient race and reveals all about the new Codex. 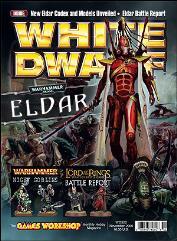 The Black Templars find more than they bargained for on a forgotten Eldar Maiden World. The secrets of the Path of the Warrior revealed. Golden Demon winner Tim Holly shares his techniques for painting greenskins. Ideas for representing damage to your tanks. It’s a points match battle to the bitter end – Mat Ward and Adam Troke go to war. A look at cavalry and how best to use them in The Lord of The Rings strategy battle game. Coming soon – the armies of the Empire – plus U.S. offers, tournaments, and other events. Jervis discusses Dave Cross’s many creative contributions to the Hobby. Getting the most out of Citadel glue. The best of the best from this year’s competition in the Windy City. Ways to use the Bitz Filez pages from the Games Workshop Complete Catalog.